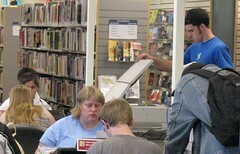 Is your library interacting with Gen Y adults? If not, why not? A recent Pew Internet & American Life Project study suggests they are the portion of the adult population most likely to visit a public library. They are also more tech savvy than any other group. Here’s my suggestion: Use Facebook and MySpace to reach different age groups. During a recent email exchange with librarians talking about teens, I suggested that they aim their new Facebook page at an older demographic. Continue the flashy teen-related agenda on MySpace but change gears and go after the twenty- and thirty-somethings on Facebook. Don’t make the Facebook page a mere copy of MySpace. The initial response was hesitation: it would mean lost opportunities to publicize teen events. Besides, it was said, there aren’t many programs and events to highlight for 20/30’s anyway. That was exactly my point! Let’s become more relevant to them though the social web. While many 20s/30s are beyond the teen stuff, they aren’t always tied into any college networks or resources either. They are the people a public library might want to find and connect with using social networking. They need it! Job hunting, residence finding, reliable transportation, starting families, the new world of income tax, and money juggling are all issues to them. We have the resources. I’m familiar with one library that has a marketing plan filled with programs geared toward kids, teens, and patrons over 55. There’s a huge gap there waiting to be explored. Dismal turnouts at past programs for adults usually discourages interest in considering them, but I’d be willing to bet social networking — available from home at personally convenient times — is the key to that group. Let the library’s MySpace page cater to teens, but develop a Facebook presence that’s fun, attractive, and useful to that neglected decade of library patrons. Would any public library be willing to try it?